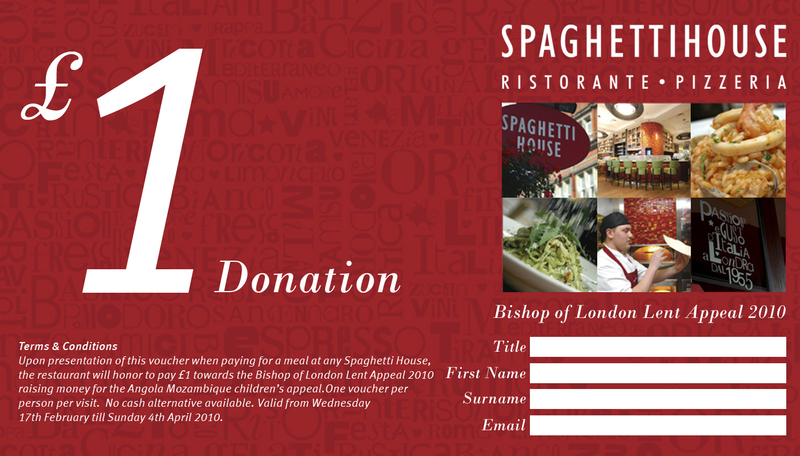 Dear colleagues,Fundraising in YOUR parish this Lent.For the past four years the staff of Spaghetti House in Knightsbridge have supported the Diocese’s Lent Appeal in our parish. Over that time they’ve helped us as a parish to raise over £50,000 for lenten good causes (not all from Spaghetti (!) – but their help has been invaluable). Good ideas have a habit of growing. for a bulk delivery of printed vouchers) – and if each of you hands one over when you pay, they’ll give £1 per customer per meal to the Bishop of London’s Lent Appeal, every time you eat there this Lent.
) and contact your local manager – he or she will be glad to help. Is there a catch? No. It helps them, of course: but it helps the Appeal too – and if, in the midst of it all, your congregation gets to know one another better and you get to know the manager and staff of your local restaurant, it might be not a bad idea! The Spaghetti House – in partnership with the Diocese of London: for the good of children in Angola and Mozambique .